Signature : Echizen Daijo Fujiwara Kunitsugu. We hand the sword after touch up polish will be done. Blade length : 61.9 cm or 24.37 inches. Width at the hamachi : 3.02cm or 1.19inches. Wide at the Kissaki : 1.93 cm or 0.76 inches. Kasane : 0.62cm or 0.244 inches. with Jinie attach and Chikei work. there are many Ashi and Yo work. Boshi Ichimai style. as a student of Dewa Daiyo Fujiwara Kunimichi. Probable He made a lot of swords for his master. Therefor he made few swords during his sword life. This sword is nice Hamon and fantastic quality. in Japanese sword) He might be the son of the Kunimichi. The signature is very similar with Kunimichi. 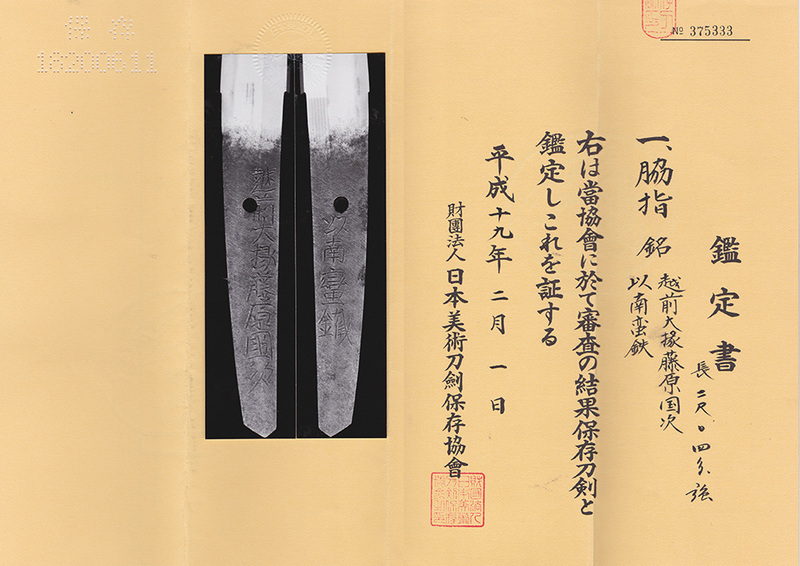 We attach the signatuure (gassaku collaborative）sword Dewa Daijyo Hujiwara Kunimichi and Kunitsugu. Tsuba: Iron Tsuba, dragon is engraved. Menuki: Shakudo, dragon is engraved. Fuchikashira: Shakudo, dragon and carp are engraved with gold color.